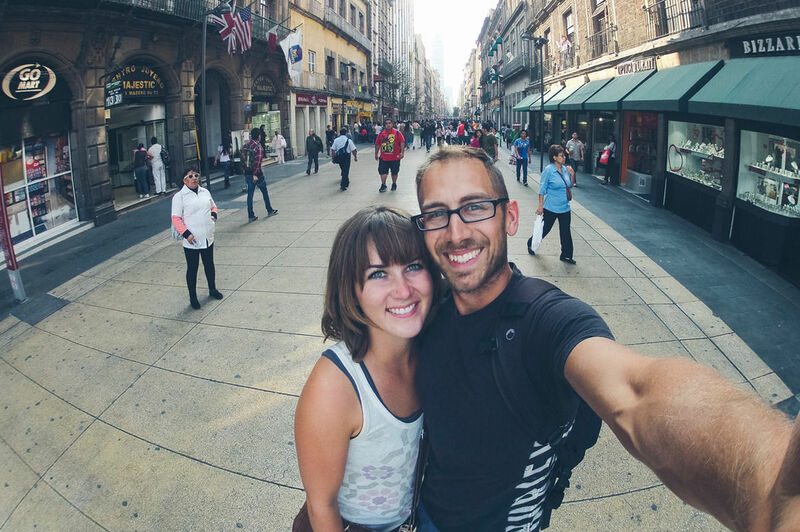 Dodging the 9-5, Richard and Ashley have found new purpose with a life on the road. Richard and Ashley were tired. Tired of staring at their computer screens. Tired of routine. Tired of deadlines, and bills, and mundane nine to fives. So tired, that they ditched it. Quit their job, sold their stuff, bought a Toyota Pickup and left their home in Vancouver to head south, no, not Florida, but Central America. The type of journey that will always gets a Huckberry stamp of approval. Currently enjoying the sun and shores of San Pedro La Laguna, Guatemala, we recently caught up with these two traveling aficionados to help us fill in the gaps about their decision, their life on the road, and a glimpse at what’s to come. When did the idea come about for the trip? And how'd you decide to leave it open ended? Ashley: I had been working full-time as a Paralegal and was starting up my own nutrition business. In the process I found that I had lost myself in work and needed to remind myself of the things I loved to do. After a session with my business mentor I had a massive meltdown as I realized that it was time for my life to change in a big way. I knew I needed to take an extended break. I texted Richard and told him that we needed to have a life chat, which resulted in us deciding to take this trip. Richard: I had been following a few other couples who have done similar trips and always had it in the back of my mind to do a long road trip... always putting it off to the following year. I had recently picked up the truck and had a long term build plan for it when Ashley texted me about needing to have a life chat. Within weeks the old engine was out, new suspension was in, and we only had a few months to finish it before our drive south. Leaving it open-ended was easy... we knew that quitting our jobs was going to be necessary for any trip longer than 3 weeks. We might as well go until the money runs out! Clearly making the truck was a big part of preparation, but was there a lot of other planning? Ashley: Surprisingly we did hardly any planning. We were so busy trying to wrap up work and get the vehicle ready by our departure date that we kind of neglected other planning. We literally bought travel insurance half an hour before closing time on the day we left. Now that we are on the road though, we do quite a bit of research finding places to stay and deciding on the highlights. We also find that chatting with other travelers can be a great way to find out information on campsites and great activities. We really only plan a couple of days in advance, as we find plans will inevitably end up changing anyways. Richard: The major prep at home was tying up loose ends in Vancouver. We put our condo up for rent, had to sell our other truck, used craigslist to sell furniture and other belongings, and then moved the rest of our junk into storage (Ash's parents' basement). Are you guys working off an itinerary, or just winging it? Ashley: We have been doing both. During the first 4 months of the trip we were winging it and took our time in places that we enjoyed. Now that we are past the halfway point we have to be more aware of our timeline to make sure we will be back in Vancouver by mid-May. Richard: Baja was one of the favourites. We finally made it to Mexico and were able to spend weeks camping on the secluded beaches, watched the Baja 1000, had the opportunity to sample all of the great Mexican food, and were able to unwind after years of sitting at a desk under florescent lights. Overall the Mexican people were some of the friendliest we have ever met. As for safety, we never felt unsafe or threatened. We didn't have any issues with corrupt police officers or road blocks. Ashley: Yosemite National Park was a highlight for me, as well as the colonial town of Guanajuato in Mexico. Belize was fantastic for outdoor activities: snorkeling, swimming, off-roading, camping, and hiking. We enjoyed the caribbean style food and it was a nice change after 4 months in Mexico. So far Guatemala is my favourite country as there is so much to do and the scenery is incredibly beautiful! How has living out of the truck been? Ashley: I like pretty things, cleanliness, hot showers, big beds, and flushing toilets. To be honest though, the transition was much easier than I anticipated. Our truck is our home now, and I am totally comfortable living out of a suitcase, Rubbermaid containers, and sleeping in our tent every night. Richard: This is our new normal. It's amazing how quickly you can adapt to new environments. Our house remains the same, but the backyard is ever changing. I think most people view a trip like this as out of reach. How are you able to pull it off? And, what's something the everyday desk-warrior would need to do to pull it off for her/himself? Richard: The hardest part is to make the decision. Sell anything you don't need (property, furniture, vehicles, etc.). Simplify your life by downsizing. Create a budget. Cut out the crap you don't need, and then cut out even more. Stick to inexpensive countries. Honestly if you don't have many payments back at home you don't need much on the road. In Mexico and Central America you can live well on $50 per day or less. The longer you stay in one place the less you will spend. We budgeted about $60 per day and will be on the road for 7 1/2 months before heading heading home to refill our bank account. Finally, any plans to come back? Any end date in mind? Ashley: We will be back in Vancouver in the middle of May. Our plan is to return to work for 8 to 12 months to pay off the debt that has accrued on this leg of the trip and save for South America.